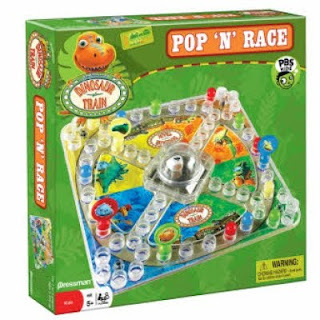 We recently had the chance to try out a variety of Dinosaur Train games from Pressman Toys. 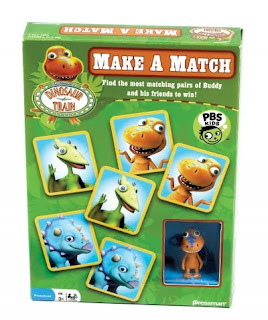 Buddy and his friends sharpen players’ memory skills in this special matching game that features a Buddy figure! Pop the dice dome and move your pieces around the game board. Your special dinosaur mover has to get home first – when a foot print shows on the game die, it will help you get there quicker. 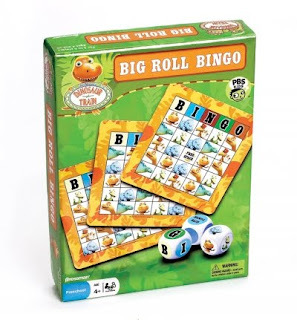 It’s a child’s first bingo set, combining the fun of the classic game with special Dinosaur Train elements. Oversized dice let you know if you can cover up a picture. A special game die and rules have been designed for a second level of play. What we thought: So this review was definitely one of the kiddos favorites and for good reason! These games are all super fun for the whole family:) We have played every single one over and over again...even D gets in on the action playing on somebody's team. These games are great for teaching basic preschool skills like counting, colors, matching and sorting, not to mention an excellent way to introduce fair play, working well with others, good sportsmanship and self-confidence! And all that with one of the kiddos favorite cartoon themes, The Dinosaur Train, which of course teaches the kiddos about science and prehistoric animal(or dinosaur:) life! These games would make excellent (and affordable:) Christmas gifts for the preschoolers on your list this year! 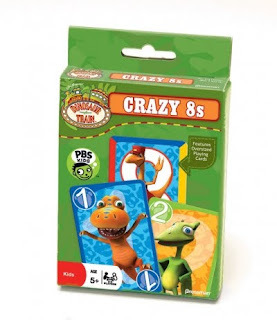 ABCD Diaries gives Dinosaur Train games by Pressman Toy an A+!! 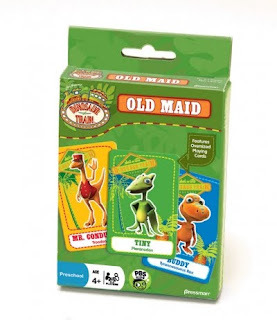 Buy It: Find these super fun Dinosaur Train games at mass merchandisers and toy stores nationwide!! Disclosure: ABCD Diaries was given a box of games for review purposes only. We were in no other way compensated. The opinions expressed in this post are ours and ours alone. Entered Stocking Full of Hersheys. Win an Orient Watch USA giveaway! Entered Family Dinner Cookbook giveaway. Entered Yo Gabba Gabba giveaway. Entered Hershey's Candy Stocking giveaway. Entered Dewey's Nine Lives giveaway. It would be a collective gift for all my kids. These would be for my son Justin. Entered the Mrs Renfro's Salsa Giveaway. Entered the Holiday Gift Pack giveaway. I would give these games to my son and daughter. They love Dinosaur Train. I entered the Huge Holiday Gift Pack giveaway. I would gift them to my two daughters. Thanks! my son would love these- thanks! I have 2 nephews these would be perfect for. My daughter loves Dinosaur Train and these would be for her!! I would give these to my 2 little grandsons. I would give this as a gift to my great-grandson Brian. I'd split these between my oldest nephew and my oldest niece. These games would go to my almost-5-year-old grandson. He loves Dinosaur Train. My nephew would really love these! I would give some to my son and some to my nephew. I would give them to my daughter -- she LOVES the Dinosaur Train!!! These games would go to my grandkids, except for the Pop n Race game-I want that for myself! 2.I'm already a follower on GFC. Too bad my son is 20 - he used to be a dinosaur fanatic. One time my sister was visiting, so he asked her to read him his bedtime story. He picked out a dinosaur sticker book. She stumbled over the names of all the dinosaurs and he kept correcting her! She has NEVER forgiven me for that! 5 year old Tristan would enjoy playing these games. If I won the games they would go to my little grandson. These would be for my two preschool grandsons, Joah and Jace. I would give these to my five year old daughter. These would be a gift for my toddler son! These games would be perfect to give to my little grandson. I would give these to my daughter and my nephew! Thanks! I would give them to my daughters! They love Dinosaur Train! I would give these to my kiddos for Christmas. All of my boys love Dinosaur Train so I would split these between them! My boys would love to get these.They both love dinosaur train and the 3 year old is starting to get the concept of games.Thanks! Oh...my dinousar train loving 3 yr old DS would go crazy for this. He is starting to want to play games, but we mostly have princess games for his older sister. He would love his own games. I would give this to my daughter! She loves Dinosaur Train!